How long do I have to leave my driveway before I can drive on it? Maximum strength will be obtained in 28 days. How do I calculate how much concrete I need for my project? Use our easy concrete calculator (at the bottom of our Homepage) and round up to the next 0.2m3. 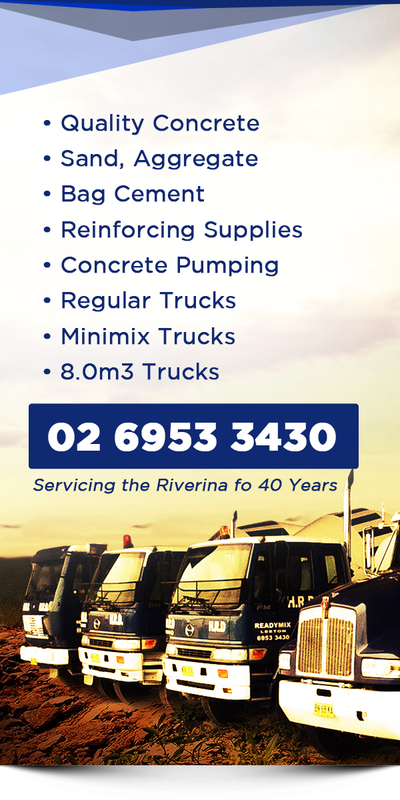 If you require further assistance in calculating your concrete needs, please contact our knowledgeable staff. How far can your concrete pump reach? From the front of the truck, the pump boom can place concrete approximately 26 metres away. Using a concrete pump is great for hard to reach projects where, for example, formwork prohibits close access for concrete trucks. How do I know what mpa (strength) concrete I need? As a basis, if you are constructing a footpath, garden shed slab or postholes, 20mpa would be fine. If you are driving light vehicles on the concrete, 25mpa is suggested. For forklifts and trucks to drive on, 32mpa would be recommended. Our helpful staff can better advise you on a case by case basis. What if my driveway is narrow? For narrow access we would use our Minimix truck. What trucks do you have? We stock mesh and mesh products, concrete sealer, bags of cement, premix, pit and river sand, aggregate (blue metal), crackerdust (crusher dust). We can also deliver stabilized sand and stabilized dust, 5mm and 10mm exposed aggregate. Can I get coloured concrete from HRD Readymix? We generally only stock black oxide, as it is the most commonly used colour. However, we can order the colour you require for your project. It can take a few days to receive your order. Our staff can assist you with calculating the quantity required for your project. Please see the attached pdf or call in to our office for a colour chart. PLEASE NOTE: - Colour reproduction can vary when viewing colours on your computer screen. Are your staff able to lay my concrete? No. We are a ready mix supply company; however we can help you find an experienced concretor to help you with your project. Please contact us for assistance. How do I calculate how much concrete I need for my slab? Measure your area where the concrete will be going and multiply length by width by depth. eg. 4.5m long x 4.2 wide x 100mm thick (4.5x4.2x0.1) = 1.89 cubic metres of concrete required for this job. How do I calculate how much concrete I need for my posthole? Square postholes are calculated the same way as a slab (see above). For round holes, measure the diameter and depth, then, half the diameter to get the radius, then calculate by multiplying the radius by the radius, multiply by 3.142, then by the depth. e.g. 25 postholes 300m wide x 600mm deep (0.150 x 0.150 x 3.142 x .600) = 0.0424, then multiply by how many postholes you have. 25 x 0.0424 = 1.06 cubic metres of concrete required for this job.